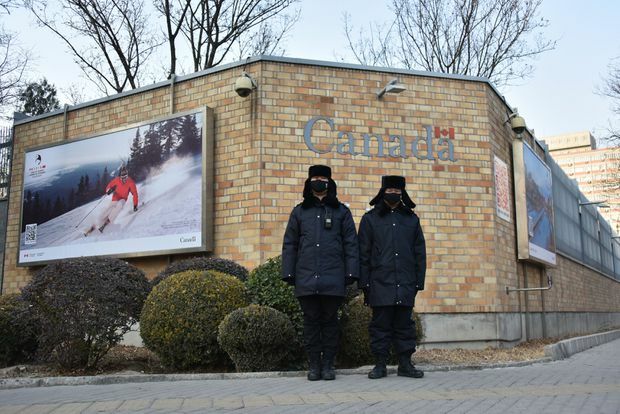 Chinese police officers stand guard outside the Canadian embassy in Beijing, China on Dec. 10, 2018. Escalating tensions between China and Canada have started to take a toll on corporate deal-making between the two countries, threatening a multimillion-dollar investing relationship that leaders in both countries had long sought to cultivate. The distrust that has followed the detentions of Canadian citizens by Chinese authorities, in apparent reaction to the arrest in Vancouver of a top executive from Huawei Technologies Co., is sending a chill that could see deals scrapped or delayed or terms made more onerous. Companies have been forced to reassess the risks. The chill has brought uncertainty to the broader business environment, raising doubt over Chinese willingness to invest in Canada, particularly by politically-sensitive state-owned firms, even as tourists show new signs of fear over travel between the two countries. The diplomatic friction only adds to concern over a drop in deal activity that had already begun. In 2016, Prime Minister Justin Trudeau visited China with ambitions to “reset” the relationship, promising “greater economic and social benefits for both our peoples." The two countries agreed to explore an extradition treaty and free-trade agreement. Neither has materialized, nor have the Chinese visions of a golden era with Canada. Instead, relations have been largely tepid. Before the countries became locked in the current dispute, Chinese investment had already tailed off. In the first half of last year, before the Huawei dispute flared up, it dropped to $668-million, extending a decline that had started in 2017, according to the China Institute at the University of Alberta, which tracks Chinese investment in Canada. Lower foreign investment is largely attributed to the tighter capital controls the Chinese government imposed to stop domestic money from fleeing the country. China also worried about its state-owned entities making frivolous, or aggressive, acquisitions. In Canada, Chinese firms have been burned on a number of oil and gas deals, betting on poor companies that lost them money after the energy boom crashed. After a lengthy review by then-prime minister Stephen Harper’s Conservative government in 2012, state-run CNOOC Ltd. bought Calgary-based oil producer Nexen Inc. for $15.1-billion. Chronic operational problems have plagued Nexen’s steam-driven Long Lake, Alta., oil sands project, with production lagging the development’s design capacity by a wide margin. Two years ago, it booked a $1.4-billion impairment to the project, citing weak oil prices and other mechanical woes. The message to Chinese business leaders from government officials has been abundantly clear – avoid Canada. At the moment, “Canada is not good,” said a note sent in December from a Chinese firm to a Canadian banker who has worked on investments between the two countries. “The mood is one of uncertainty and caution and nobody actually knows,” said the banker, who was granted anonymity because of the sensitivity of the situation. As the rift widens between Ottawa and Beijing, two Canadians – Michael Kovrig and Michael Spavor – are being held in rooms with 24-hour lighting and often interrogated six hours a day without access to a lawyer. A third, Robert Schellenberg has been sentenced to death. Huawei chief financial officer Meng Wanzhou, meanwhile, cannot return home to China as she stares down possible extradition to the United States. 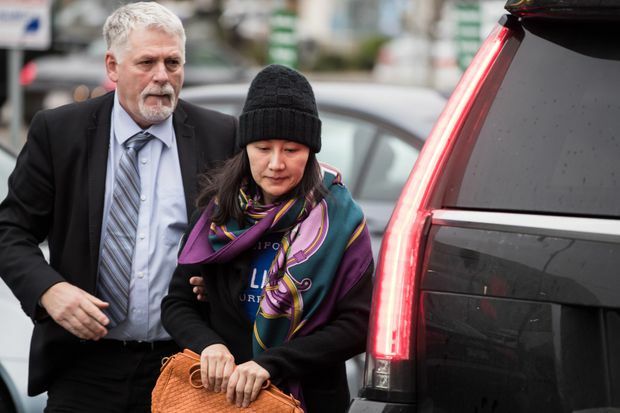 Huawei chief financial officer Meng Wanzhou, right, arrives at a parole office with a member of her private security detail in Vancouver, B.C., on Dec. 12, 2018. State-owned enterprises will not go near deals in Canada right now, because the Chinese government is unlikely to approve any such transaction, a person at a Canadian financial institution who works on cross-border mergers and acquisitions said. Difficulties increased in mid-2018 after Canada’s rejection of the $1.5-billion takeover of construction firm Aecon Group Inc. by China Communications Construction Co. Ltd. over security concerns. No formal actions have been taken — no tariffs or organized boycotts, and several people reached by The Globe and Mail said they have seen no change in the trade of goods. Chinese buyers are still buying Canada Goose parkas and East Coast lobsters, although trade figures for the past month have yet to be published. But in Canada, many are avoiding business trips to China, said Jérôme Beaugrand-Champagne, a lawyer from Quebec who has practised law in China for 18 years. And the detention of Canadians has erected what Mr. Beaugrand-Champange called “a masked trade barrier,” by raising fears of arbitrary action. The Dec. 1 arrest of Ms. Meng, and the anger that has ensued, have brought new anxieties. At Beijing Utour International Travel Service Co. Ltd., a major Chinese tourism firm, “we’ve seen a drop in people’s interests in travelling to Canada since December. The number of travel orders has plunged 50 per cent,” said Zheng Pei, who manages the company’s U.S. and Canada travel department. The Globe and Mail contacted some of the largest Canadian corporations with significant business in China. None voiced concern. “We do not wish to comment on this matter,” said Simon Letendre, a spokesman for Bombardier. Representatives for Teck, Manulife and Power Corp. did not respond to requests for comment. “We will not be commenting or doing media interviews on any judicial or bilateral government matters,” said Laurie Wilhelm, spokeswoman for the Canada-China Business Council. The CCBC has, however, arranged a Chinese New Year cocktail reception for members on Jan. 24, with a guest list that includes Chen Xueming, China’s consul-general in Montreal. Mr. Amm, the Torys lawyer, cautioned that China can’t afford to cut itself off from the Western world. “They really do need to invest abroad," he said.